ITALIENSK RESTAURANT VED SØERNE - Ristorante Da Nino e Franco er en autentisk italiensk restaurant på Blegdamsvej overfor Panum Instituttet. Restauranten har eksisteret på den samme adresse de sidste 30 år og har en hyggelig og imødekommende atmosfære. GLIMRENDE MAD TIL FINE PRISER - Restauranten er kendt for at servere autentisk italiensk mad til meget rimelige priser. 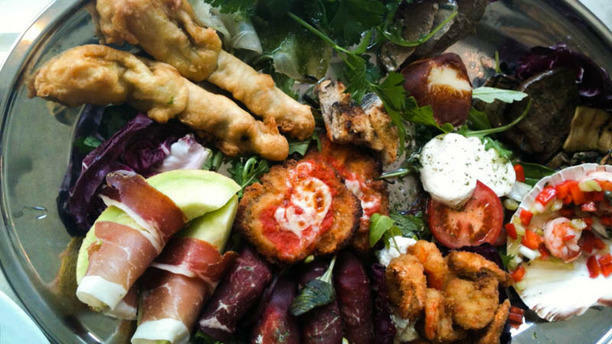 Således kan du på menukortet finde et flot udvalg af glimrende antipasti, pasta, pizza, hovedretter og insalata til beløb, der ikke slår bunden ud af din tegnebog. ITALIENSK INDRETNING - Restauranten har en ærkeitaliensk indretning, med rødbrune fliser og sirligt opstillede borde med hvide duge, servietter og levende lys. I samme stil er der på væggen ophængt rustikke kobberkasseroller, ligesom der i loftet er ophængt dekorative italienske bastflasker. My girlfriend and I went there fr dinner 04/08. Food was okay but terrible service. Firstly, we wanted to eat outside but the man in charge tried to lure us inside in an effort not to clean the tables outside (there were NO clouds in the sky)! He was then really pushy in telling us what plates to decide, he was in such a hurry that we ended up choosing what he “suggested”. Finally, when we were going to pay we had a 50% discount wih TheFork. Plates were 129 DKK each (2 ppl) and we ordered tap water... he charged 185 DKK! Was water worth 1/2 of the plate!?! In any case, I find this place with good food but the people managing it is outrageous, deceiving and unnaveptable behavior! We ordered tomato soup and salad as starters. They were really good. I had ravioli as main course. To be honest the best I ever tasted. Freshly made. My husband had generous portion of beef tenderloin with cheese sauce. Good value for money and highly recommended to visit this restaurant. Very friendly staff. Good food and good advice on choice.